This product is now obsolete. Please click here for the current models. 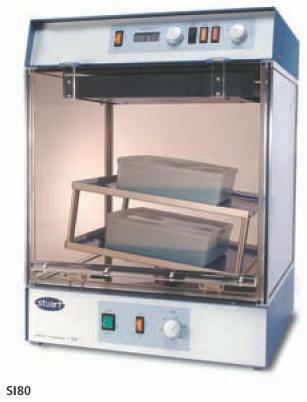 Construction is similar to SI50 but with a rocker that provides a gentle motion, ideal for low foaming agitation, blotting techniques, DNA extractions, staining and de-staining gels, etc. The blue non slip mat holds vessels in place. The tier system means more platforms can be added to increase the working space. A choice of two tier heights is provided with each unit for maximum versatility. 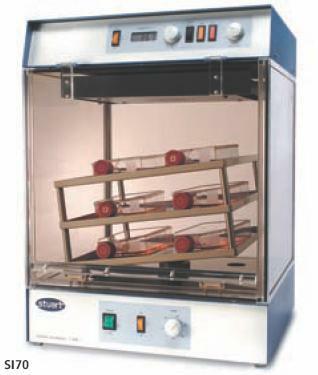 The rocking speed is variable and has electronic feed-back control to accurately maintain set speeds. The rocking action is automatically halted when the door is open for maximum user safety. The angle of the rocking platform can be adjusted allowing optimisation of the rocking motion.